Ryan Gerber is a biochemist and has always been involved with agriculture, growing up on a family farm. 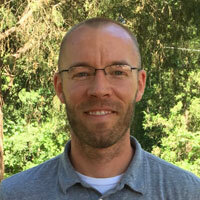 Prior to joining AgBiome, Ryan worked at DuPont Pioneer where he was involved with their insecticidal gene discovery team. In this role he was involved with all aspects of the process, focusing on protein purification leading to the discovery of many novel proteins from various sources. Ryan completed his undergraduate work at Bethel College (Kansas) and his MS from the University of Nebraska-Lincoln where he worked on agriculturally important mycotoxins. Both degrees are in Chemistry, with heavy emphasis on biochemistry. In his free time, Ryan enjoys spending time with his family, being outdoors, as well as rooting for the Huskers and Jayhawks.